Detailed with yellow daffodils and green stems against a green and cream background. The 16" shade rests atop a wonderful four-footed base with teardrop design and teardrop cluster. 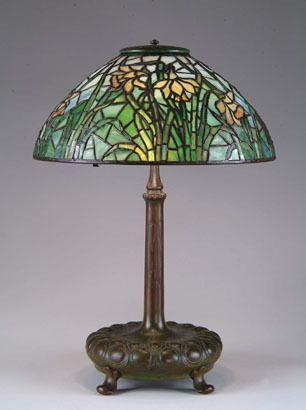 Shade is marked "Tiffany Studios New York" and the base is marked "Tiffany Studios New York 6842". SIZE: Overall height is approx. 22-1/2".